Achievements- Elected as Club Captain and breaking both arms when trying to stop at the Ski Village! On or off piste? – Though I love waist deep powder, there’s nothing better than carving down the piste in the morning on a crisp day with a blue sky! Current equipment- Dynastar Omeglass PRO skis, Salomon boots, Anon Blitz helmet and Leki everything else! Favourite bands- Arctic Monkeys, The Fratellis, the Kaiser Chiefs, Kasabian and Green Day to name a few! Personal statement- I started skiing at the age of 7 and joined the Sharks Ski Club soon after. I love representing Sharks in a variety of ski competitions including Slalom, GS and Moguls and trying new ways to challenge myself in order to try and improve my all round skiing ability – after all I think the best skiers will try all of the different disciplines. 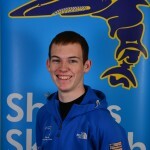 More recently, after an amazing 10 years at the club, I have joined the Sharks instructor team and I am currently enjoying passing on all the wisdom given to me by one of the best ski clubs around!